Where to donate for China earthquake? 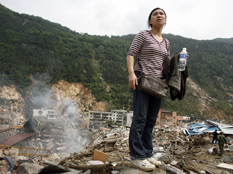 Posted bystlplace	 May 14, 2008 May 19, 2008 1 Comment on Where to donate for China earthquake? (Update May15) My friend Sun also set up a donation page for earthquake relief. He even put up a challenge (match) for Paypal donors. Kudos to him. I sent a check of $51.20 to OSCCF today. 1. Overseas Saving Chinese Children Fundation: as name implied, the emphasis is on the need of small kids. 2) Economy: most bang for the buck (I don’t have a lot money, but I want my money have meaningful impact). 3) With the unravel of devastation, money will be poured in. How to direct the money the most in need and reduce the waste will not be a trivial problem. Thanks for mentioning the donation. Hope this will help to raise more money for the relief.